We speak English, & Español (Spanish). The first PRK surgeries were performed in Germany in the late 80’s the FDA’s first approval for PRK in the United States was in 1995. This laser procedure is very effective in treating patients that have nearsightedness and astigmatism. This procedure is fairly simple and straightforward to perform as there is no knife used to create a corneal flap. The surgeon will wipe away the corneas surface cells called the epithelium using a special brush and then the surgeon will use a computer-guided laser to remove microscopic layers of tissue from the cornea. The laser used for PRK surgery is a special laser which is a cool ultraviolet light beam. The cornea is reshaped to allow the light to focus correctly on the retina that will provide the patient with clear vision. All our patients will undergo a very comprehensive eye exam and a series of eye tests. The doctor will discuss the proper plan for your eye condition and if PRK laser eye surgery is the correct path he will explain the procedure and answer any of your questions during the consultation process. When you arrive on the day of the surgery you will be guided through the entire process by your surgeon. You will be given some topical anesthetic eye drops to numb the eye for a completely painless correction. Before the laser is used on your eye the center surface area of the epithelium is removed with a special tool. This portion of the surface of the eye will heal naturally and quickly within a few days of the surgery. When the epithelium is removed the only the stroma is exposed and this is the section of the eye that is reshaped by the laser to correct your vision. During the procedure, the surgeon will use the laser with a pre-program generated from the comprehensive eye exam that will reshape your stroma and correct the patient’s vision. After the PRK laser surgery, the surgeon will place a contact lens on the eye to help the healing process and also to aid in comfort. Typically, the lens is worn for 3 to 4 days to allow the eye’s epithelium is regenerated and fully heal. After about a week you should have clear crisp vision after the PRK laser surgery. Most people can see much better right after the surgery but the full results are not seen after the healing is complete in about a weeks time. Some blurry vision is normal because the surface area of the eye, the epithelium needs to fully heal, regenerate and smooth back. Some patients may experience some temporary effects which are normal during the healing process. Some which may include: dry eyes, light sensitivity, halos, glare and sometimes unclear vision in low light conditions. The complete healing time and vision stabilization normally takes about 1 – 4 months. Your surgeon will discuss any and all possible complications during your initial consultation. Remember no two peoples eyes are the same and healing times and conditions will vary. Your doctor will require you to use eye drops after your PRK laser surgery. Each case is different but usually, you may be required to use anti-inflammatory, antibiotic and moisturizing eye drops. Sometimes patients may require steroid drops after your procedure Dr. Roberts will instruct you on which eye drops are required for you and your condition. It is normal and is much more common to have some discomfort with PRK surgery when compared with LASIK surgery. Most patients experience slight discomfort for a couple of days following the PRK laser surgery. Normally this is treated with over the counter medications to relieve any discomfort. Very few patients will experience more discomfort requiring a prescription pain reliever. 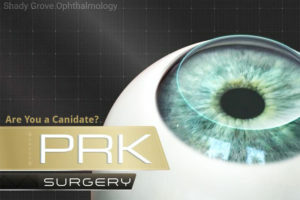 Photo-refractive keratectomy, also known as PRK, is a procedure that corrects vision by reshaping the cornea. This procedure can be used to correct nearsightedness, farsightedness, and astigmatism. First, anesthetic eye drops will be used to numb the eyes; no injections or needles will be used. Next, the surgeon will remove the epithelium, a thin layer of protective skin that covers the cornea. Then, computer-controlled pulses of laser light are delivered to reshape the cornea. The laser will be programmed with the information gathered in your pre-operative exam. The laser treatment will be completed in less than a minute or two, depending on the amount of correction needed. At Shady Grove Ophthalmology, we understand the importance of your vision. Dr. Anthony O. Roberts is committed to using some of the most advanced technology available for vision correction, cataract removal, and treatment of eye disease. With innovative laser systems, multi-focal intraocular lens implants, and state-of-the-art techniques for cataract surgery, Dr. Roberts aims to give all of our patients the safest, most effective eye treatments. Our entire office staff prides itself on delivering personalized premium quality eye care to all our patients. 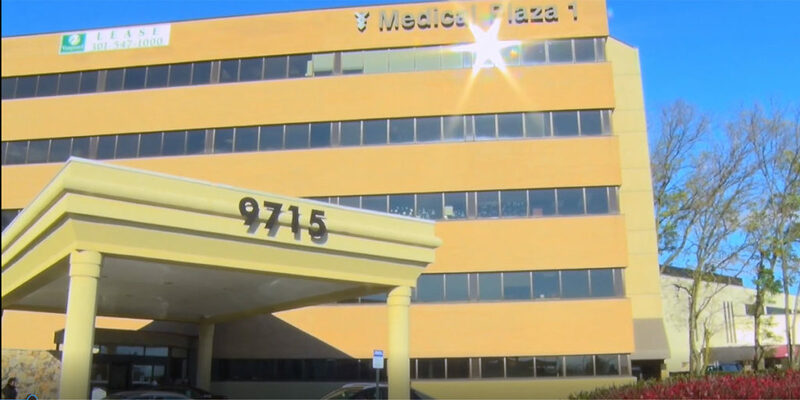 Shady Grove Ophthalmology offers patients several financing options for procedures such as LASIK, cataract surgery, eye exams, glasses, and contact lenses. These flexible financing options make vision care more affordable.